I have no shortage of sequins in my wardrobe, some sadly underused. But I think it was seeing Eve and Tracey looking so marvellous in their Baukjen sequin jackets that led me, subliminally, to air a few from my own collection this weekend. Friday was spent with my youngest at the Natural History Museum. I was by no means the only person wearing a variation on the skinny jeans + sparkly top combo but to that I say bravo: sequins are now common as daywear which can only be a Good Thing. This sweater is a navy one from Zara – currently unavailable online but I’m certain I’ve seen it in store in the last week or so. It’s a good one for day, I think – the navy is softer than black and the sequins quite subtle. T-shirt, Primark. Jeans, H&M. Ballets, Bloch. Sweater, Zara. On to Saturday where my husband, our children and I celebrated what might possibly have been the last day of real summer with an afternoon on the Southbank. The Real Food market is fantastic and beats sitting in a restaurant or cafe hands-down, I think, especially with kids. On to the roof gardens where the kids were encouraged to pull up carrots, pick tomatoes and water plants with readily available watering cans, while we soaked up the sun with a Pimms in hand. I was dressed for comfort and the inevitable burger/ ice cream spillages in slouchy trousers from H&M but made sure I caught the sun with some multi-coloured H&M sparkles – a bargain at £9.99. My husband’s been working madly these last few weeks and I’ve barely seen him so Saturday night we took ourselves off out to eat at Hix. I was reliably informed by Gina that it wasn’t massively dressy, I went for some sequinned bottoms from La Redoute – now only £11.25! They are super comfy as they are essentially tracksuit bottoms underneath all of those sequins (which meant more room for pudding, right?). With them I wore a grey t-shirt from Cos under a softer-than-soft grey knit and studded heels (dubbed The Shoe of Hotness by me), both from Zara. 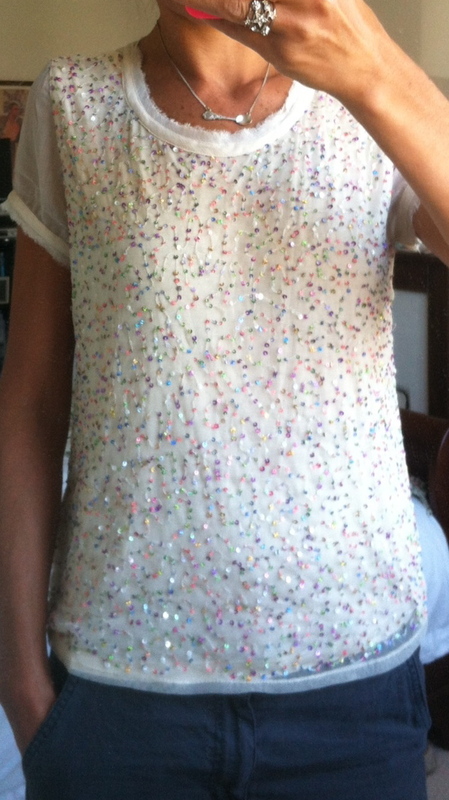 In other sparkly news, I may have done a complete volte face on the Zara sequin bomber, which is now in my possession. I blame my second born, who walked straight up to it, stroked it and said “Oh Mama … this is so pretty for you.” It’s now awaiting its fate in a carrier bag next to my bed: if it has not been worn within 21 days of purchase, I will return it before the 28 days is up. What do you think of it? And now for this afternoon’s event – a Princess Party for a 6 year old. Somehow I think that sparkles will abound! This entry was posted in Baukjen, Children, Cos, H and M, Outfits, Zara and tagged Hix, La Redoute, Real Food Market, Southbank on September 16, 2012 by Sarah WornOut.